Cooking wild meat means all edible wild birds and animals; those which have not been domesticated. This could be anything like wild turkeys to bear and many other wild animals. Most popular are game birds, rabbits and venison or deer meat. Most of the time these people hunt for their own food as a hobby. Aside from enjoying their hobby of hunting, cooking wild meat provides free food for these people and their families. Wild game has its own unique wild favor which many hunters love; soaking in salt water will eliminate some of this strong taste. Because this wild game is free to roam or fly and eats naturally from the grasses, it is leaner than domesticated meat therefore being healthier to consume. Since you will be out in the open when hunting, proper care should be taken with wild game to preserve its freshness and quality. Drain the blood from the dead animal and if possible it is best to clean the catch in the field and ice it down to quickly bring the temperature down; always remembering to keep the surrounding environment clean and sanitary. This requires planning ahead and having the right equipment and supplies with you. After arriving home with the meat, thoroughly wash the meat, cut in pieces as you want to cook it. Wrap meat in plastic wrap and then in freezer paper; place in freezer as soon as possible. PICTURES ABOVE I want you to meet Brent. He is the grandson of a lifelong friend of mine, Frank. Frank's mother and dad were friends of my mom and dad; all our siblings were friends. When this picture was taken, Brent was nine years old ( will be 10 in one month). 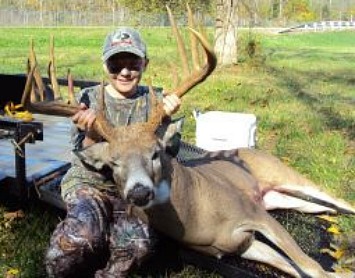 This is Brent's first deer and he got it with a cross bow; It is an eleven pointer and weighed over 225 pounds. This will make a lot of venison recipes! I want to thank Frank and his dear wife for sharing their grandson with us. Of course, thanks to Brent for letting me share his prize with all our readers. I am so proud of you! NOTE: My dad always said to get the “gamey” taste out of wild meat you need to soak the meat in salt water a few hours. Here is another suggestion that I read: marinate the meat in coffee. You can add other spices and seasoning or use only coffee. Make delicious wild recipes for venison jerky, quail, duck with orange sauce, pheasant with sour cream and elk. People with a self reliant living often include meats that many would not even try when cooking wild game. Squirrel recipes might be some that you would hesitate to try although it is very good. It is similar to rabbit but more delicate in flavor. A medium size squirrel is about two servings and is cooked like you would cook a rabbit. Squirrel meat is very lean and should be covered with pork fat is it is going to be roasted. Dress and clean squirrels; wash in several fresh waters and pat dry. Mix cooking oil with lemon; cover squirrels with mixture and let stand for 1 hour. Combine crumbs with enough milk to moisten; add mushrooms, salt, pepper and onion juice. Stuff squirrels with crumb mixture; sew and truss. Place in roaster; place piece of bacon on each squirrel. Roast uncovered for 1 ½ to 1 ¾ hours or until tender; baste every 15 minutes with olive oil. For some, self reliant living people consider stew squirrel recipe a delicacy. When learning how to cook squirrel, stewed squirrel is very flavorful almost like stewed rabbit. Clean 3 squirrels, cut lengthwise into halves. Simmer in water until tender with 1 pound of carrots. Blend 6 tablespoons bacon fat with 6 tablespoons flour. Blend flour mixture in with 2 ¾ Cup strained squirrel stock in a saucepan; stir until smooth. Add ¼ Teaspoon minced onion, 1 bay leaf and salt to taste. Cook mixture over medium heat until thickened. Remove bay leaf and serve over squirrel. Cooking wild meat applies also to Groundhog recipes OR woodchuck recipes; the same animal. This wild meat is cooked like you would cook chicken or rabbit. Brush meat with melted butter; season with salt and pepper (or chicken seasoning if desired) Roast in a moderate oven of 350F degrees for 30 minutes per pound or until meat is thoroughly cooked and tender. Beaver recipes are another of the foods that self reliant living trappers often fix to eat. Clean beaver thoroughly and soak in fresh salt water overnight. Cut beaver into pieces and rinse again; pat dry. Beaver is a greasy meat and the red wine in the following recipe cuts the grease. Sprinkle beaver pieces with salt and pepper; dredge with flour. Oil large deep skillet and brown pieces on both sides over medium heat. When meat is browned add onions and brown them. Add wine over the meat and onions, cover with lid; simmer over low for 1 ½ to 2 hours or until meat is very tender. Cooking wild meat can be a challenge for someone who has never tried it. If you have never eaten wild meat I would suggest making sure you do soak it in salt water but cooking wild meat will be well worth your efforts!